In his work, Paul Cezanne paid much attention to such a genre as still life. Especially liked the master to carry on their canvases fruit. He clearly thinks out the composition of the paintings, determining the proper place for each of the objects. More often than other fruits, Cezanne liked to write apples because of their beauty and variety of colors. “Still Life with Apples”, written in 1890, amazes with the richness of colors, internal simplicity and at the same time the versatility of everyday things. The compositional center of the canvas is a white plate with apples. These fruits are perfect: they are bright red, liquid, ripe, even and of the same shape. It can be seen that the apples ripened and poured under the gentle sunshine. A few more fruits occupy the forefront of the canvas: two green apples and a bright yellow lemon. 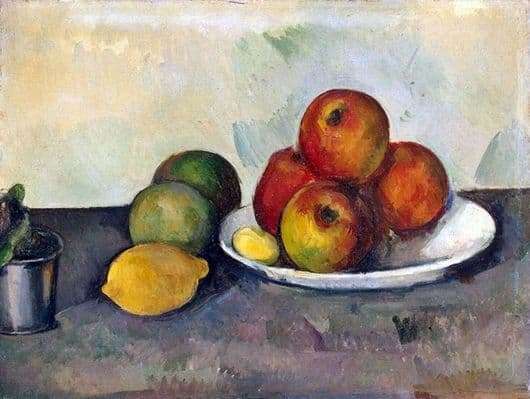 Cezanne masterfully finds a place for the fruit in the picture, his strokes are simple and precise. Background canvas ugly, does not distract from the main content of the picture. Fruits lie on a brown-gray table. The background is a smooth, bare wall of pastel color. The feeling of depth when looking at a picture is achieved by the contrast of bright, appetizing fruits, written in rich colors, and nondescript tone. Cezanne made the genre of still life meaningful for art, and not second-rate as it was before. He set himself a difficult goal – to stun the whole of Paris with simple apples. And he succeeded, because of its fruits, it was said that they wanted not to eat or peel, but to copy. “Still Life with Apples” is so beautiful thanks to Cezanne’s “beautiful formula”, which he found on his own. For the master, color and form were an indivisible whole, he developed his own style and manner of writing fruit. This master’s work, being a masterpiece, forces many viewers to peer into it even more closely.